This is a study in positive and negative shapes that I started a couple of years ago. Today is the day that it came back to the surface of one of my piles of things to do. So, here we go. 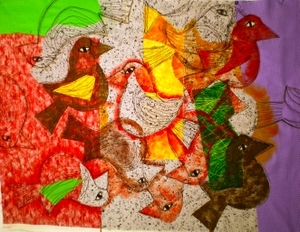 I used a simple, hand cut stencil to paint the birds, using inexpensive acrylic paint. Some of the birds were painted using the cut out stencil piece as a resist, and some birds were painted the usual way by filling in the stencil "hole" with paint. The painting was done on a raw edge collage of fabric. The bird eyes were cut out of striped fabric. 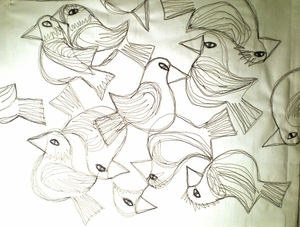 After I outlined all of the birds with black machine stitching, I decided to take a picture of the back of the piece. Maybe a thermofax screen with this image would be a good thing to have.... Now to layer it up and quilt. Wow, the picture of the back is really neat. It would make a good start for an autumn day card. "It was a windy sorta day..."